Interleague play brings about a decision point for where a fan’s loyalties lie. Enemies become friends, friends become enemies …cats and dogs living together in harmony. For example, with the Cubs playing the Minnesota Twins and Cleveland Indians over the next ten days, are White Sox fans inclined to – gasp – root for the Cubs to win? These guys are their division rivals, so if the Cubs beat them, they are helping the White Sox improve in the standings. But can White Sox fans root for the Cubs in good conscience? Likewise, the Sox are in Milwaukee to play the Brewers starting today and go to Cincinnati to face the Reds next weekend. 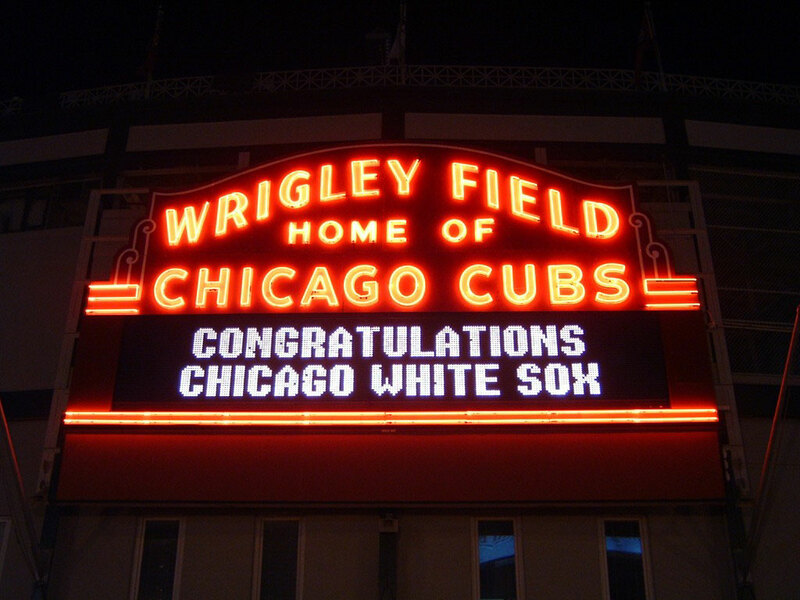 So will fans of the Cubs be rooting for the – gasp – White Sox in interleague play? I would say there is a difference between wanting your rival to lose and rooting for the team playing them to win. Really I think these games can be seen as either a win-win or a lose-lose proposition, depending on your outlook. For a team like the Cubs that have a legitmate shot at winning their division, every game counts so their fans really must pull for the opponents of their division rivals – even if that means wanting the White Sox to win. However for fans of the White Sox where their team is not expected to contend for the division title, perhaps it is more compelling to want the Cubs to lose in interleague games so fans of the Cubs have nothing to razz Sox fans about come October. For me, I think for this season in particular every single game matters so I would like to see the White Sox sweep the Brewers and Reds on the road …however unlikely that may be. But I will stop short of the “Go Go White Sox” chant becuase I still don’t like ’em. I will quietly pull for the Sox win and most importantly for the Brewers and Reds to lose. How about you? Can you root for the Chicago White Sox to win this weekend and next? As for what happens between these series, all bets (and gloves) are off! Bust out your Cubs wear and go to Wrigley Field and US Cellular Field to root for the Cubs in the Crosstown Classic!